Size of this preview: 424 × 600 pixels. Other resolutions: 170 × 240 pixels | 339 × 480 pixels | 543 × 768 pixels | 724 × 1,024 pixels | 2,481 × 3,509 pixels. Source https://www.loc.gov/exhibits/world/images/wt0070_1s.jpg Originally from en.wikipedia; description page is/was here. Beohar Rammanohar Sinha illuminated, beautified and decorated the original manuscript calligraphed by Prem Behari Narain Raizada. 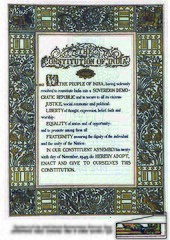 Beohar Rammanohar Sinha's legible short-signature in Devanagari-script as Ram on the Preamble-page (lower-right corner within the outermost border-design), and as Rammanohar on other pages of the Constitution bear unambiguous testimony to this fact. He was the favorite disciple of Nandalal Bose. 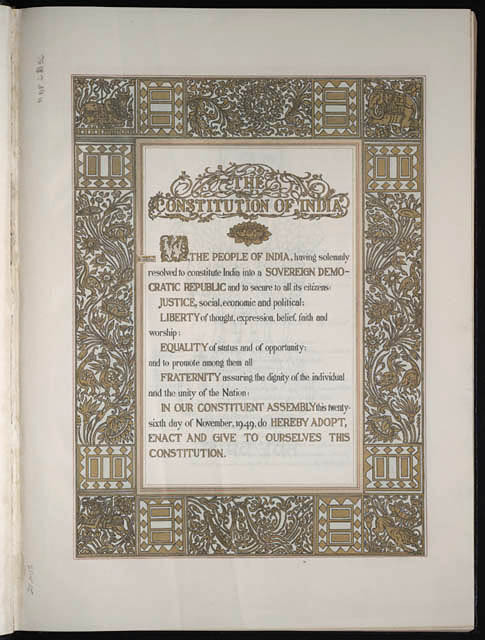 After finishing the Constitution, some leftover art-material was carefully preserved by the artist which he bequeathed to his son Beohar Dr Anupam Sinha. 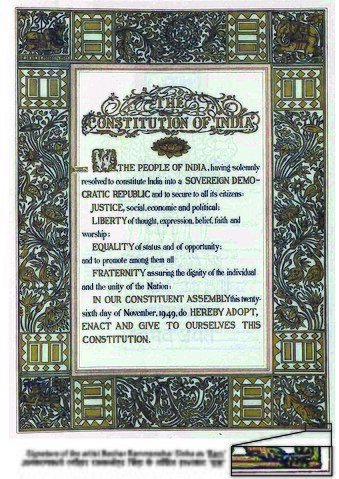 Author Illumination/ornamentation by Beohar Rammanohar Sinha, calligraphy by Prem Behari Narain Raizada. current 16:52, 30 January 2017 2,481 × 3,509 (4.19 MB) Untold Unfold Artist's hidden signature revealed.